Today in Masonic History Jesse Bledsoe is born. Jesse Bledsoe was an American politician. Bledsoe was born in Culpeper County, Virginia. He was young he went with his older brother and a Baptist congregation headed to Kentucky. Once in Kentucky, Bledsoe attended Transylvania University in Lexington, Kentucky. He would study law and be admitted to the bar some time around 1800. Shortly after being admitted to the bar Bledsoe would open a practice in Kentucky. In 1808, Bledsoe was appointed Secretary of State for Kentucky under Governor Charles Scott. He would serve as Secretary of State until 1812. In 1812, Bledsoe was elected to the Kentucky House of Representatives. In 1813, he was elected to the United States Senate. He would resign after serving a year and a half of his term. 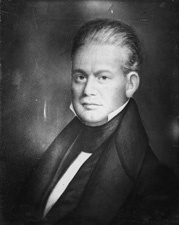 In 1817, Bledsoe would be elected to the Kentucky Senate and would serve there for three years. In 1822, Governor John Adair appointed Bledsoe to the Circuit Court in Lexington. That same year Bledsoe became a professor of law at Transylvania University. Bledsoe would eventually retire from the legal profession to become a minister in the Disciples Church. As a minister he would travel to Mississippi in 1833 and finally to Texas in 1835. In 1836, Bledsoe would pass away in Nacogdoches, Texas. The nature of his passing is unknown, some of his contemporaries and relatives would only describe it as a "significant fall from grace." Bledsoe was a member of Lexington Lodge No. 1, Lexington, Kentucky. He was also the Grand Tyler for the Grand Lodge of Kentucky in 1808.